Which games have highest GPU requirement? Sorry if this has been asked, I used the search but all my searches turned up were "Will my GPU work well enough?" type threads. I'm just curious. I saw someone had said in the Wikipedia article that "FFXII" uses the gpu fully. Well after playing around with PCSX2 with for a week... I have my doubts. 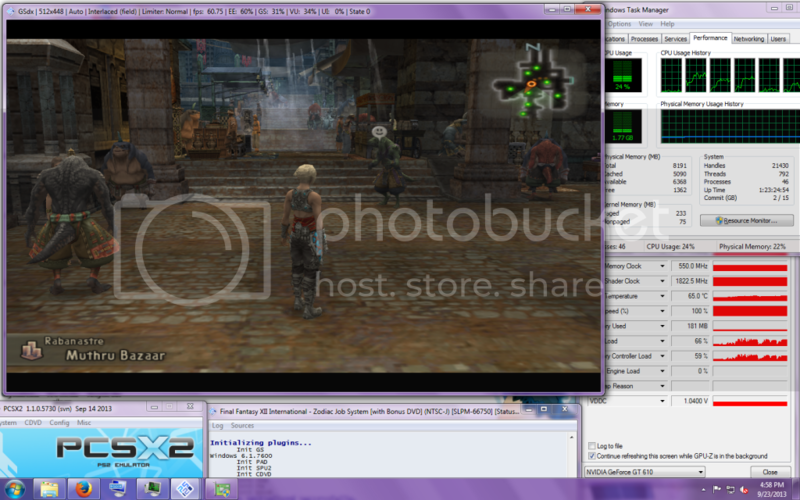 I can run FFXII at double resolution(which btw looks nice... can't wait til I get a better gpu and can try 4x) with no dropping of frame rates except during "Quickening" mode. I can also run it entirely in software at full speed. However take Burnout 3 for example. I CAN'T run it in software and at native resolution I can just BARELY keep full speed with occasional mild slowdown with lots of cars on screen. I've also been surprised that some "less intensive" games such as The Ar tonelico series(a personal favorite) I can't really get away with increasing the resolution. So either A. That statement on wikipedia about ffxii using the gpu fully is rubbish or B. it's something peculiar to my setup that's showing the difference. The only thing I could imagine is my gpu has only a 64 bit memory interface and maybe the games that I can't get away with doubling are using the memory more. BUT I read a long time ago that Squeenix used much less polygons in FFXII compared to FFX so they could get away with higher quality textures so... hmm. 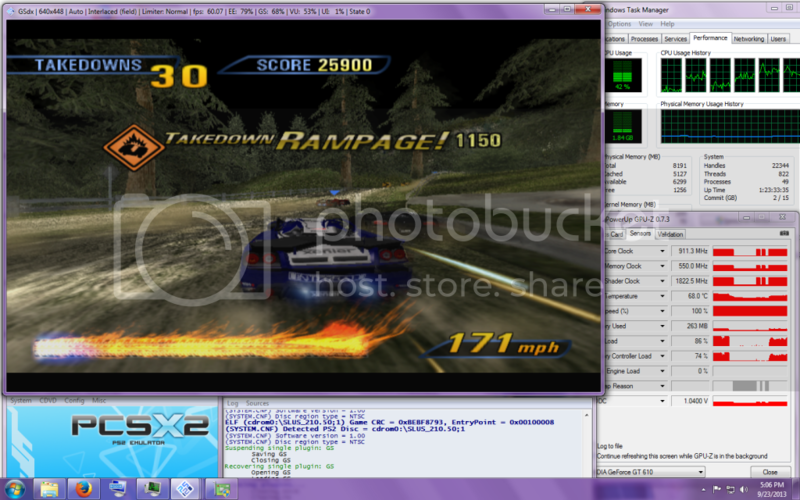 PCSX2 images are stored on an external USB 2.0 drive. CrystalDiskMark reports throughput of 40 mbytes sec sequential. It's also encrypted, all my drives are. It's the same drive I had in my PS2 using open ps2 loader on before my ps2 died lol. So I think it's probably plenty fast! Just for the record I'm not rich so I did this built in two parts. I had the PSU, hard drives and optical drives. This month I bought the mobo and cpu and case. Next month I'm dropping a fat chunk on a nice GPU. So the final real question: In your experience, what game is the most gpu intensive for PCSX2? BTW great job guys. When my first PS2 died I used pcsx2 to play Ar tonelico. Back then I had a single core athlon 64 3700+ and a radeon x850xt and I could JUST get away with emulating that game with speedhacks on. I wrote the mymc tutorial under the name "squall4226" and also wrote a hack patch to skip the videos in ar tonelico melody of elemia that wasn't needed about a month later when the emulator updated. Oh and for the record all speedhacks are off for my above measurements of performance. My most brutual gpu experiences come from the Armored Core series from 3 up to Last Raven. Whenever there is a mission involving a high heat environment where you see radiating heat waves, it just bogs down my gpu...a 7850 even with native resolution! If I remember correctly, DQ9 is pretty GPU intensive. @Blyss Sarania not gonna go into straight answer to the topic question, instead throw some hints to your post. First of all in case you didn't knew it yet about FFXII quickenings you can actually disable some background heat wave effect by either using AgressiveCRC or setting skipdraw=1 in GSdx hw hacks, which will make them way lighter and unless you're perfectionist(seeking perfection in emulation, especially ps2 one is generally wrong idea anyway, even perfectly working FFXII lacks few shadows and who knows what else;p) the loss of it will not even be noticeable and the speed increase will certainly help. Anyway no hardware can be completely used by pcsx2. First of all it'll never be able to utilize modern features neither of gpu's nor cpu's, but what's also important nothing except syntetic never to happen in real situations tests actually will do it either. There are always bottlenecks, GPU side most of the time pcsx2 is bottlenecked by memory bandwidth this will make impossible in most games to ever see 100% gpu core usage;p, not to mention the use of shaders is very light and any extra features are just totally unused and never will be. In terms of CPU this means even with speedhack allowing the use of 3 heavy threads, only one of them ever will be able to reach 100% and will hold the other ones down, so pretty much 30% of cpu usage in 6 core cpu actually easily can point at cpu limitation;P. And it's not suprising, if you look at real life benchmarks we have around here your generation of AMD cpu is at least 50% slower per same clock than intel icore cpu's which most people who bought pc specially for heavy emulation have. Over 4ghz of your cpu is as fast as 3ghz ivy or haswell, it doesn't mean the cpu is terribly slow, in fact it's enough for most ps2 games, hardly any modern cpu wouldn't be, but there are certainly a few games and most of them are actually among the most popular ones which simply requires more(some even WAY more;p). Pretty much if either of the threads listed in % at the top of GS output window shows around 100% this means you are cpu limited(yes GS% also shows gs thread running ON the cpu, since HW rendering is a hybrid between job done on cpu vs job done on gpu and only cpu side is shown by those %, through still some GS settings apply to it), if none of it does, even if gpu core usage is just average you're most likely limited by the gpu(as mentioned earlier, most likely by memory bandwidth), rarely by something else since even abusively power saving hdd can be a bottleneck;p. Just apply that bit of knowledge to what you actually see and you'll get clearer image on the game requirements. Zone of the Ender 2 and the xenasaga games at 6x will cripple even the mightest of GPUS at this time. and yeah your 610 is lowend for this emulator and even lowend for PC games. (09-23-2013, 11:24 AM)miseru99 Wrote: @Blyss Sarania not gonna go into straight answer to the topic question, instead throw some hints to your post. First of all in case you didn't knew it yet about FFXII quickenings you can actually disable some background heat wave effect by either using AgressiveCRC or setting skipdraw=1 in GSdx hw hacks, which will make them way lighter and unless you're perfectionist(seeking perfection in emulation, especially ps2 one is generally wrong idea anyway, even perfectly working FFXII lacks few shadows and who knows what else;p) the loss of it will not even be noticeable and the speed increase will certainly help. Well I chose this chip because it is the ABSOLUTE best price/performance product according to passmark when I was buying. I paid $109 for it. I just ran a Passmark benchmark to remind myself of the numbers, the Intel I7 3770k scores a 10385, my chip at this speed scores 7507. And the 3770k? $320 lol. You can see my second core has hit maybe 60%. The labels in GPU-Z are obscured but that 100% is my fan speed. 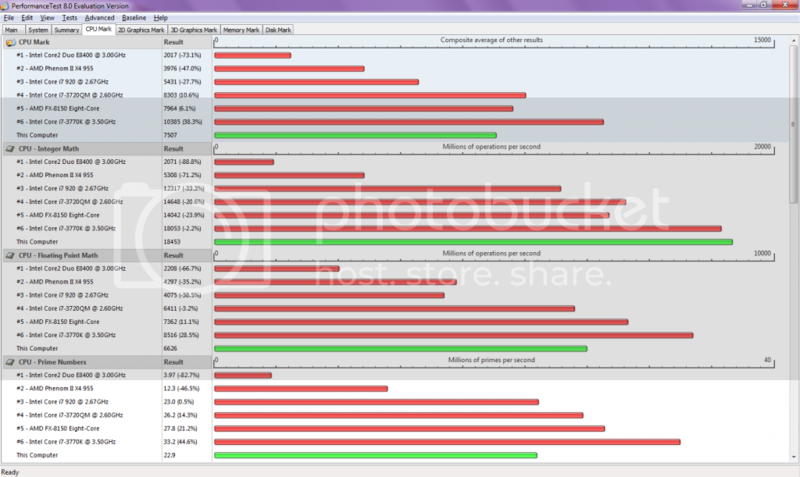 The 66% is gpu load, and the 59% is memory controller load. I ran around for about 5 minutes and finally settled at a relatively busy area to collect the data. Also note EE 60%, GS 31%, VU 34%. Last shot, same game, same settings, 2x resolution. So at least so far I'm not CPU limited. However honestly I hesitate posting this lol, it's so easy to get taken the wrong way online anymore. Please take me at my word when I say I'm not making an argument, just a friendly discussion. Besides, what kind of a geek would I be if I didn't defend my hardware a little bit lol! 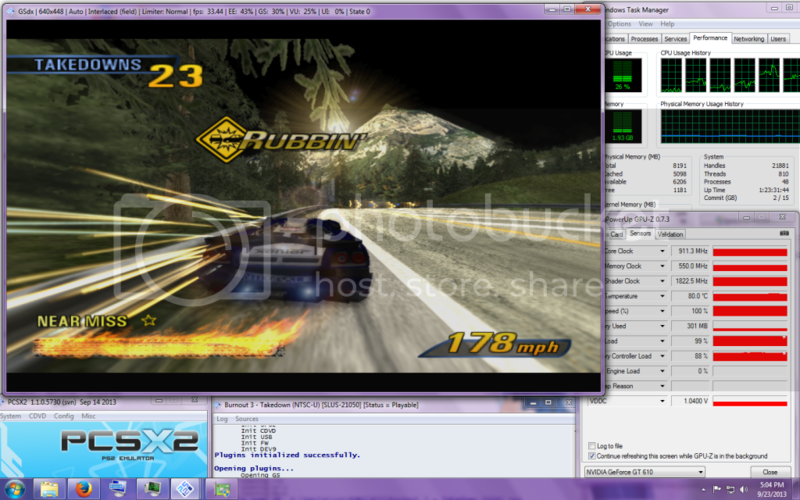 Oh but since you do seem quite knowledgeable, how come in my last screenshot, the burnout 3 and 2x resolution, PCSX2 reports such low percentages on the EE, GS and VU when it's running at about 50% speed? Is that because as you said it's reporting CPU values but in this case I'm gpu limited so it's reflecting the lower CPU usage while it waits for the GPU? Edit: oh yeah thanks for the info about the quickenings and speeding that up! Also thank everyone for the replies. I own Xenosaga and I'll have to have a look at that one! I love that game. Your GPU is definitely what's holding you back. Might wanna stick to native res for now. To the bios! Time to melt it while it's still under replacement! Kidding! Well... sort of... it is under replacement... and I really am headed for the bios to do some overclocking. I ended up figuring out that turning off MTVU made Xenosaga stay at 60FPS at stock speeds for me. No processor melting required! And I can run it at 2x on my weak GT610. I got some money and today(it's 1:01 am here) later I will be ordering a new GPU. Woot.